Opus is a term that often refers to a musical composer’s first masterwork. Opus One is, therefore, aptly named, as it’s considered the first true masterwork in American wine making. 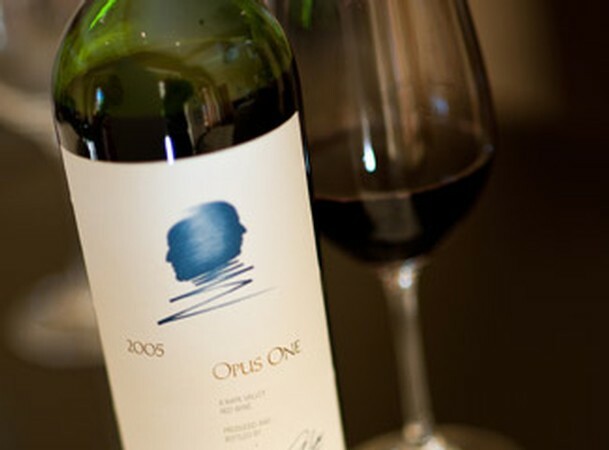 Born from a marriage between legendary wine making families, the Rothschilds and the Mondavis, Opus One was first released in 1981 and a single case sold for a record $24,000. The California winery has been producing some of the finest wines in the world ever since. It’s rather fitting then that America’s first ultra-premium wine will be the focus of a wine paring dinner at America’s original destination ski resort. The first offering in the new Sun Valley Wine Club series, the Opus One Dinner will take place at Trail Creek Lodge, this Monday night, February 13th. It will include five Opus One vintages in a vertical wine pairing (’92, `93, ’94, ’95 and 2013) and a five course meal designed by beloved local Chef Derek Gallegos, including a dessert prepared by Chris McCarthy from the Konditorei. Late on Wednesday afternoon, Chef Derek Gallegos called Chef Hal Jardine into the large, state-of-the-art kitchen at Gretchen’s in the Sun Valley Lodge. Chef Gallegos had just plated up a dish of pheasant atop a bed of sautéed leeks. The dish was gorgeous, its aroma enticingly delightful. But those two qualities weren’t enough, its taste had to be just as magical and as complex. They each then took bites of the dish, and offered one to me. Since I’m only a mere journalist and not a poet, my words will fail to do justice to how delicious it was. But, still, it wasn’t good enough for the chefs. They talked about tannic components, and balancing acidity and bitterness with a meal that will feature the red Opus One wines, and they thought they could do better. The word opus derives from the Latin meaning work, but its come to be used to describe artwork of all kinds. And that’s what a great meal really is—artwork, with some entertainment thrown on top. Chef Gallegos said he was honored when asked to create a meal to accompany the Opus One selection. Derek said his staff is excited about the opportunity to create such a unique meal and have been enjoying the culinary creations in the search of the perfectly-paired courses. As Chef Jardine explained, the subtle differences in every vintage of wine add to the challenge. “There’s always an element of mystery, but that’s part of what makes it fun, too,” he said. The meal will begin with passed hors d'oeuvres and then will consist of three main courses before dessert. In staying with a rustic Idaho-in-the-winter theme, Chef Gallegos and his team will be offering unique takes on courses of pheasant, lamb and beef. While the pheasant undergoes some minor tweaking, the beef dish will include a foie gras butter reduction and “an intense, rib-sticking sauce,” Chef Gallegos said. The lamb, however, is set to truly raise the culinary bar. He is using some of that experience for the lamb dish, which will be a giant, hand-made tortellini filled with lamb cooked in free-range veal stock. “It’s going to be a rich, earthy dish. I think people are really going to dig on it,” he said with a smile. Thanks to the wine making skills of the Opus One team and the culinary excellence of Chef Derek Gallegos and his crew, the dinner in the small fireplace room of the historic Trail Creek Lodge is sure to be an experience that will long be savored.